While I’m patiently waiting for my Japan adventure in November, I’ll happily indulge in anything Japanese I can get my hands on. So, when I was feeling bored on a Sunday afternoon, I decided to make “something Japanese”. Japanese are masters of improvisation and they never fail to take something ordinary and elevate it. It’s the same case with pastries. Western pastries and cakes, in Japanese hands, transform into something uniquely Japanese, often characterised by its clean aesthetics and natural flavours. Japanese sponge cakes are simply a delight – moist, fluffy and not too sweet. It’s the version of sponge cake that I grew up with. Oftentimes I find Australian cakes are too sweet and dense, so a Japanese-style sponge cake brings back a taste of home. While this is a “shortcake,” it is not a sweet biscuit, rather it is a layered sponge cake topped with strawberry and whipped cream frosting. 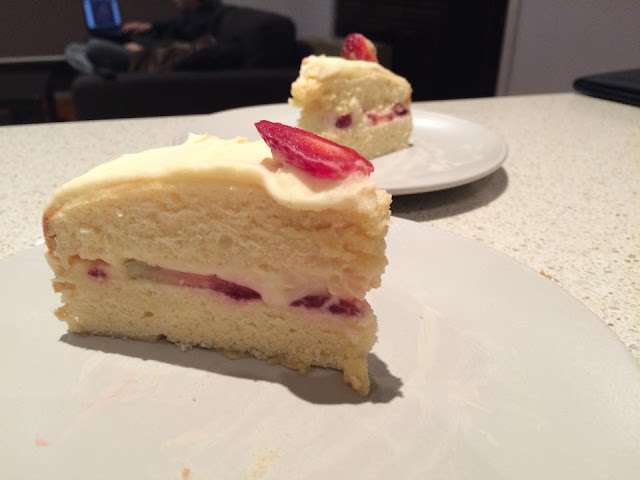 Frankly, I’ve never had a strawberry shortcake prior to making this, but I saw some cheap strawberries and I really wanted to make a fluffy sponge cake. A few seconds of Googling later, I was following La Fuji Mama’s recipe and on my way to making my first Japanese Strawberry Shortcake. I noticed that the recipe calls for cake flour, which I did not have. But my impressive internet search prowess revealed to me that you can make your own cake flour with all-purpose flour and corn starch/corn flour (Remove 2 tbsp of all-purpose flour from 1 cup of AP flour, replace with 2 tbsp of corn starch, sieve the mixture 5 times). I’ve also encountered some technical problems while whisking my egg whites. The recipe calls for egg whites to be whisked to stiff peak. But after 35 minutes, my mixture, though glossy and snowy, was dripping off my whisk, rather than standing proudly. It was completely my fault though: I noticed that my mixing bowl was slightly greasy but I decided to overlook it and continued to whisk my egg whites. I’ve also poured the caster sugar in the egg white mixture in three batches…right smack in the middle of the egg white mixture, which probably damaged the meringue. So there you go, now you know what to avoid. Ah well, I guess a soft peak is better than curdled egg white. Being a frugal Asian that I am, I decided to go ahead anyway and whip up the batter with my runny “meringue,” fervently hoping it will rise in the oven just enough so I can make a layered cake. 30 minutes later, my kitchen was filled with the wonderful scent of vanilla and butter cake. I took the cake out and to my joy, it rose beautifully! I pressed the cake and was so happy that it “bounced” back like a sponge would. It was even hissing when it first came out of the oven! After brushing some sugar syrup on the cake to prevent it from drying out, I spread a layer of stabilised whip cream, spread a layer of delicious strawberries, covered the strawberries with another layer of whip cream and the top half of the cake on top. 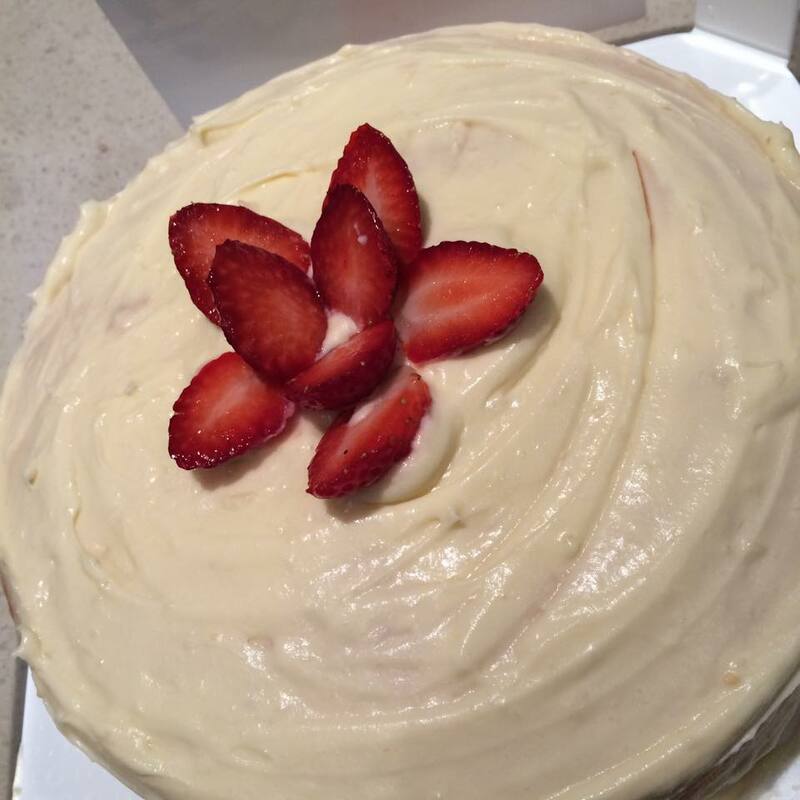 After spreading the cake top with more whipped cream frosting, I topped it off with more fresh strawberries. Then I sat back and looked at my creation with pride and happiness. It was a Sunday afternoon well spent! This cake is surprisingly not too challenging to make, but it was so delicious. The beautiful vanilla scent and fluffy sponge was a dream, while the strawberries delivered a much-needed freshness and fruity taste. It was the perfect afternoon delight and I am glad that I took the time to make this wonderful cake. Next time, I’ll make sure my mixing bowl is squeaky clean and my egg whites will reach their full potential!